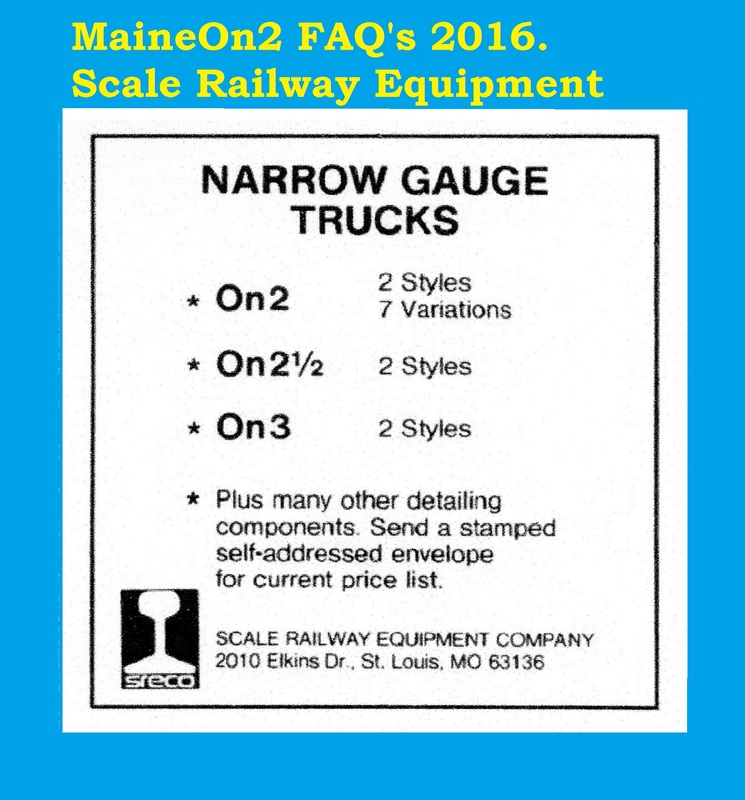 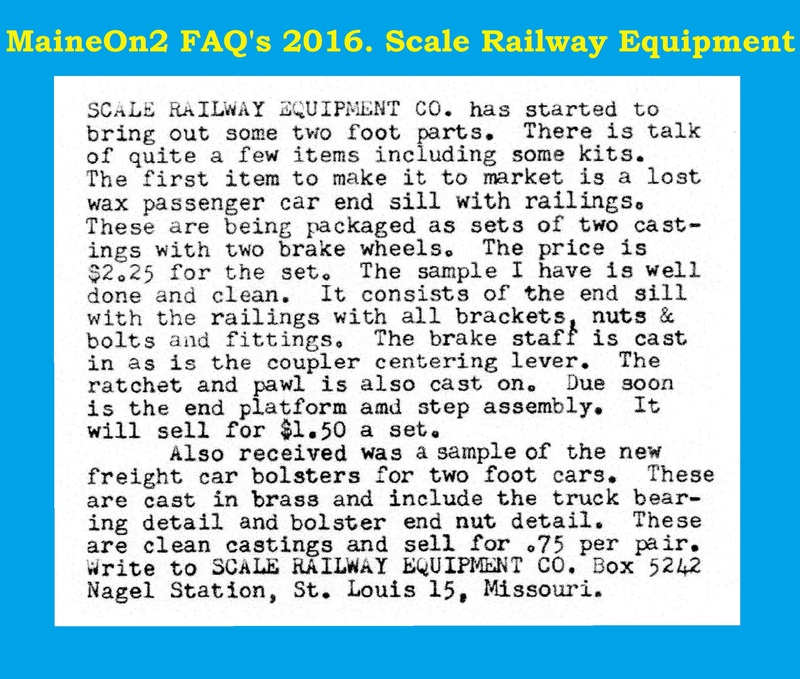 The Scale Railway Equipment Company was started by Jim Eagan sometime before the Editorial below appeared in the September 1967 edition of Finelines magazine under the heading “What’s New?”. 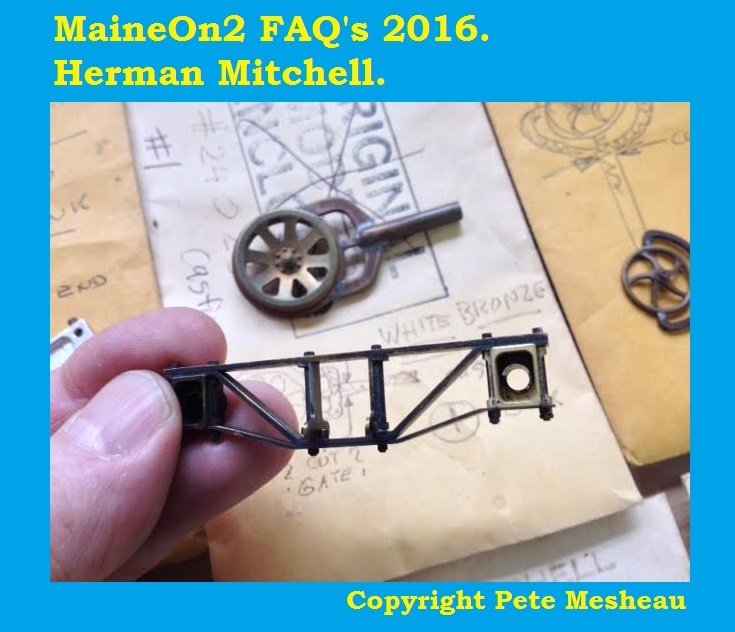 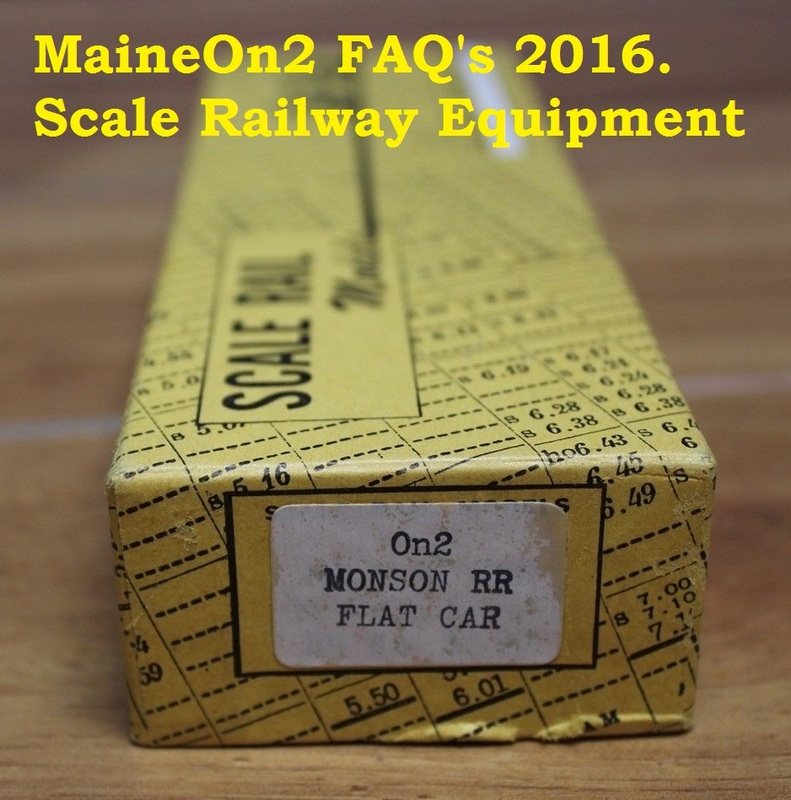 SRE has always had a reputation for quality parts for the Maine On2 modeller. 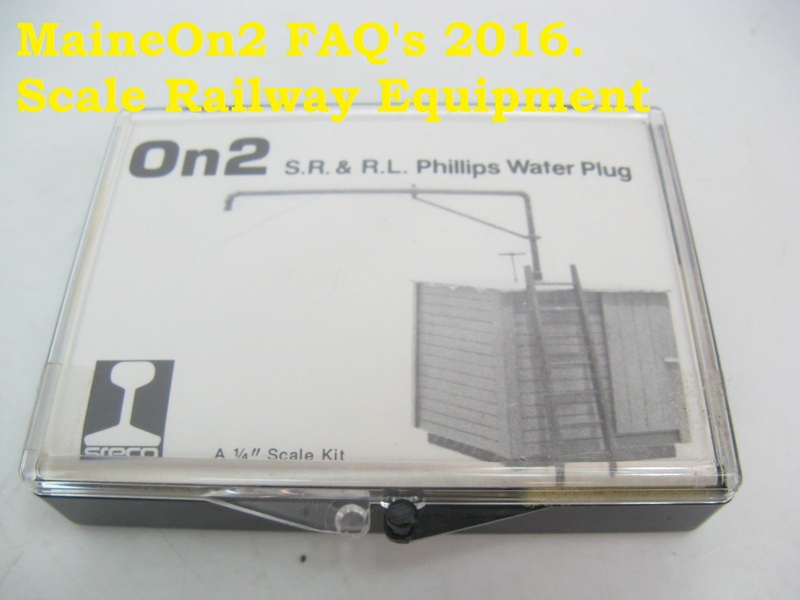 SRE parts and kits appear regularly on the current second-hand and internet auction sites, where, if correctly identified, they are sought after. 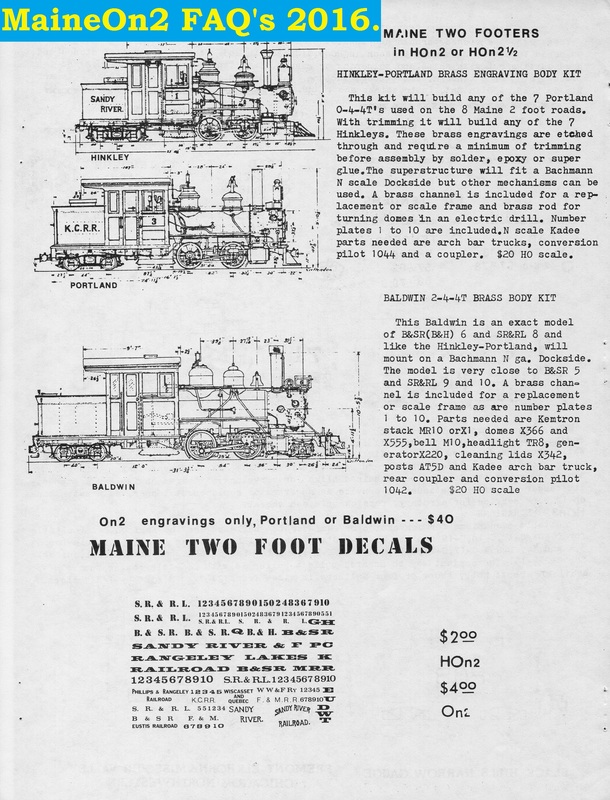 Looking backwards from our current viewpoint, the advertisements in the Narrow Gauge modelling press suggest that the SRE business wandered in directions away from the initial focus on Maine Two Foot. 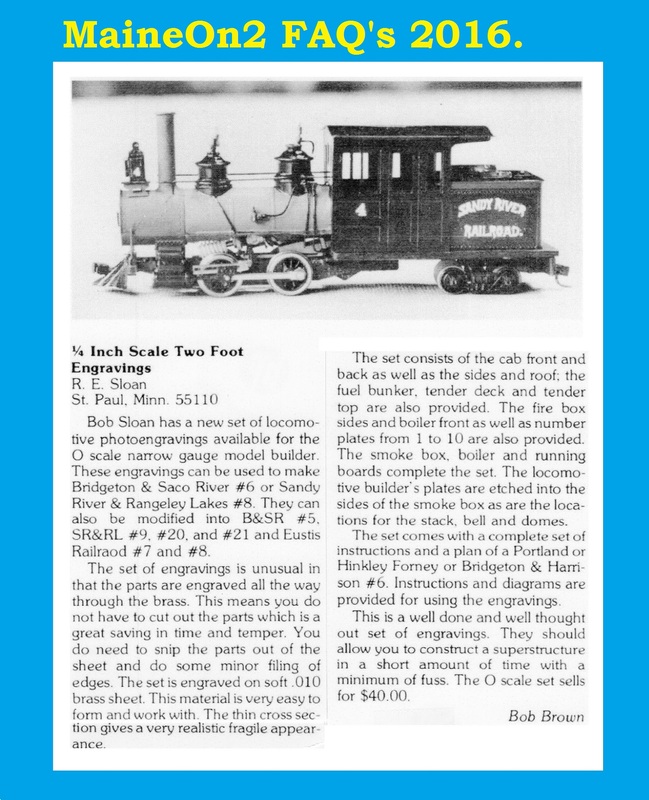 SRE is mentioned as a component supplier for the first runs of the Custom Brass SR&RL coaches and cabooses, the Town Models SR&RL boxcar and Chris Cardinal’s Laconia coaches. 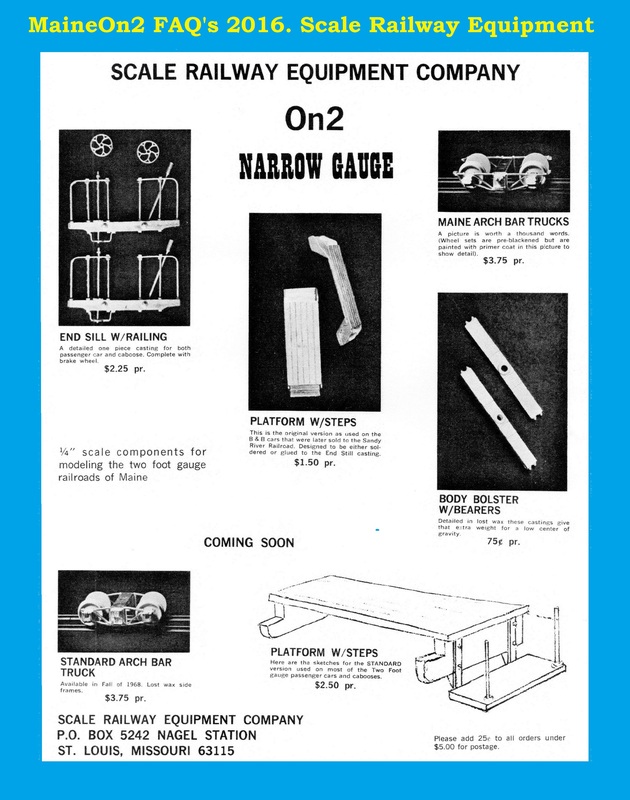 This full page advert from the May 1968 edition of Finelines magazine shows the SRE products then available. 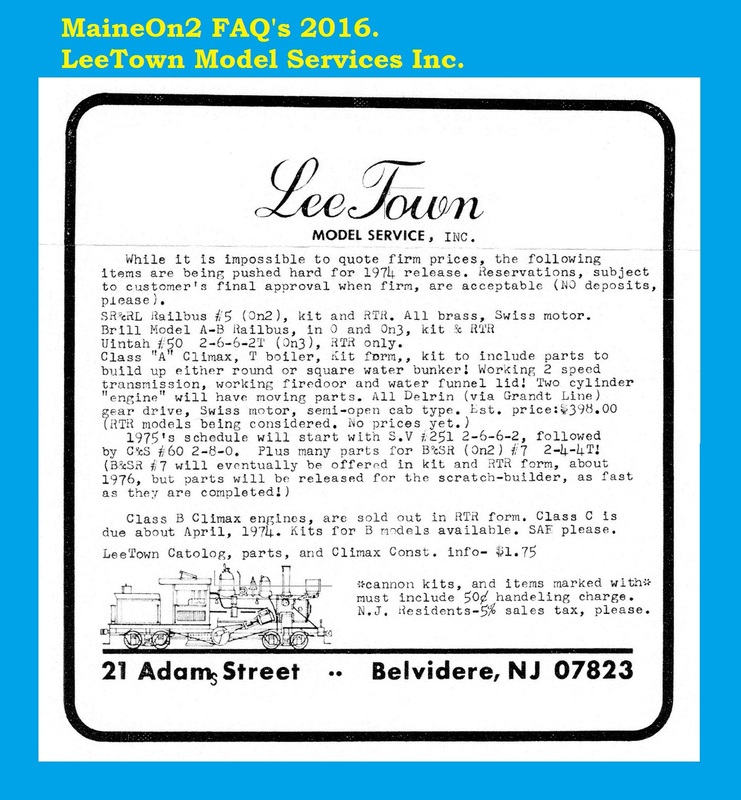 This Editorial appeared in the March 1971 edition of Finelines magazine under the What’s New? 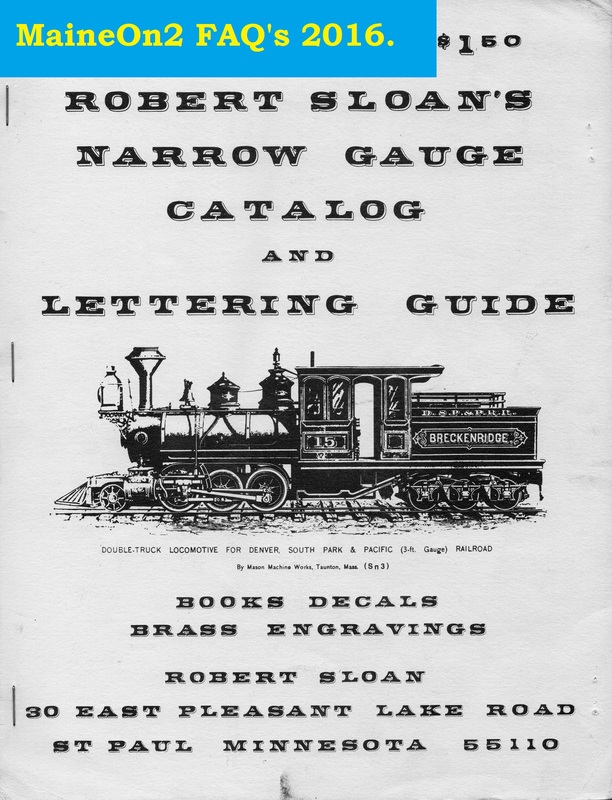 banner, and announced the arrival of the sprung lost wax brass trucks. 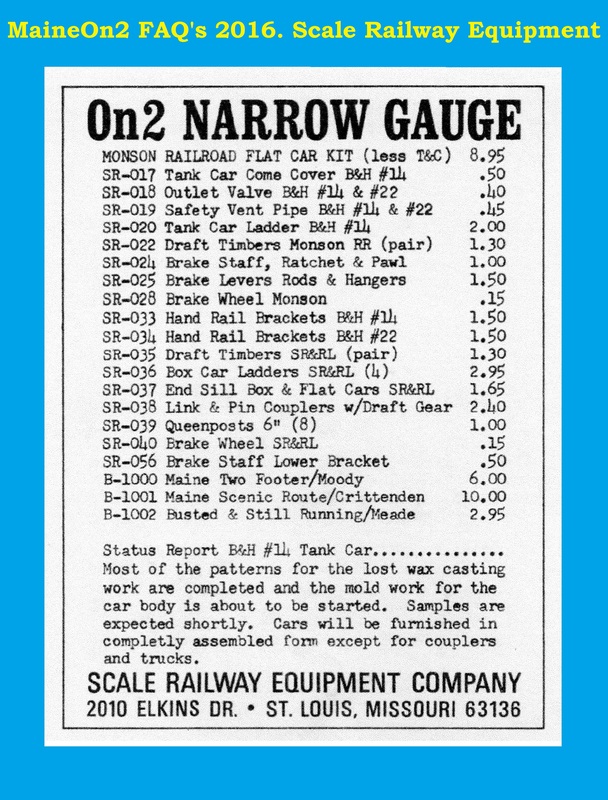 This advert from the January 1972 edition of Finelines magazine gave a status report for the large Bridgton tank car, as well presenting an increasing range of parts. 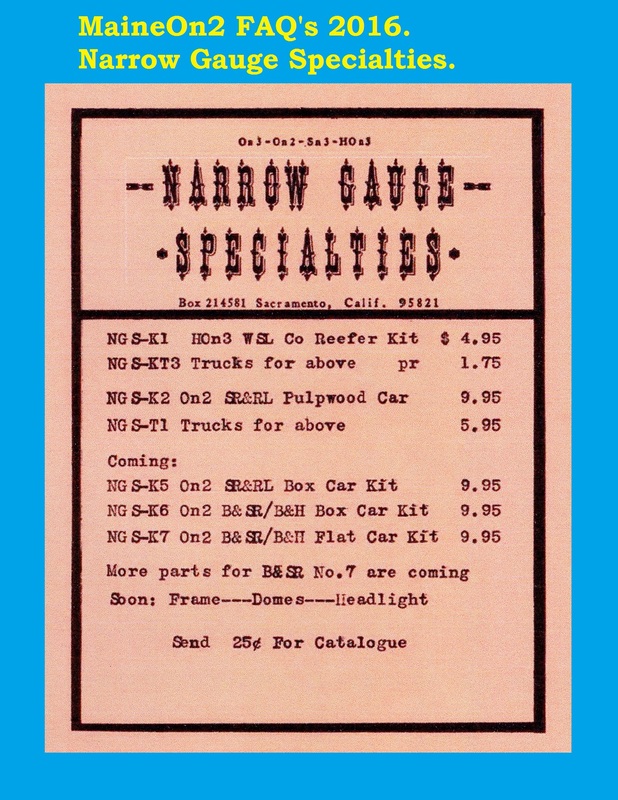 SRE advert from the January 1976 edition of Narrow Gauge and Short Lines Gazette showing the kits available for 1976 which ran throughout 1976. 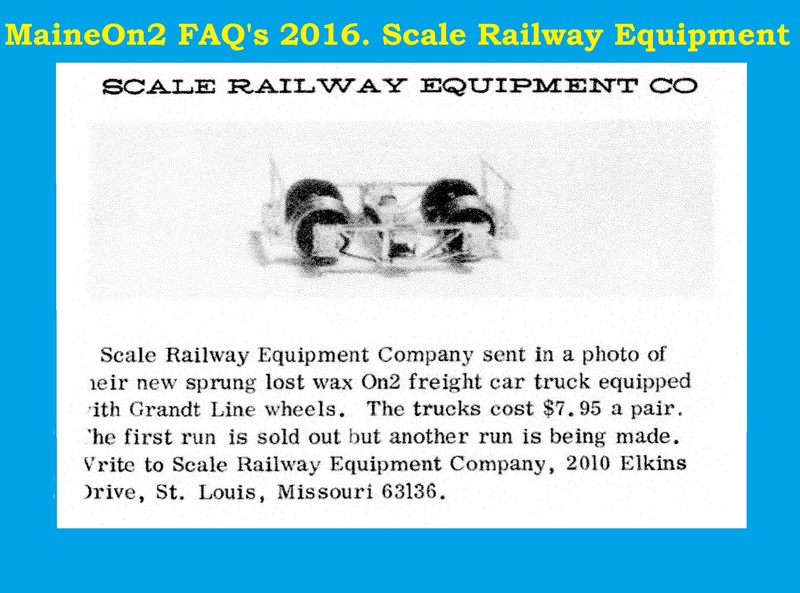 SRE placed this advert in the March/April 1978 edition of the Narrow Gauge and Short Lines Gazette magazine announcing the arrival of the lower cost white metal trucks. 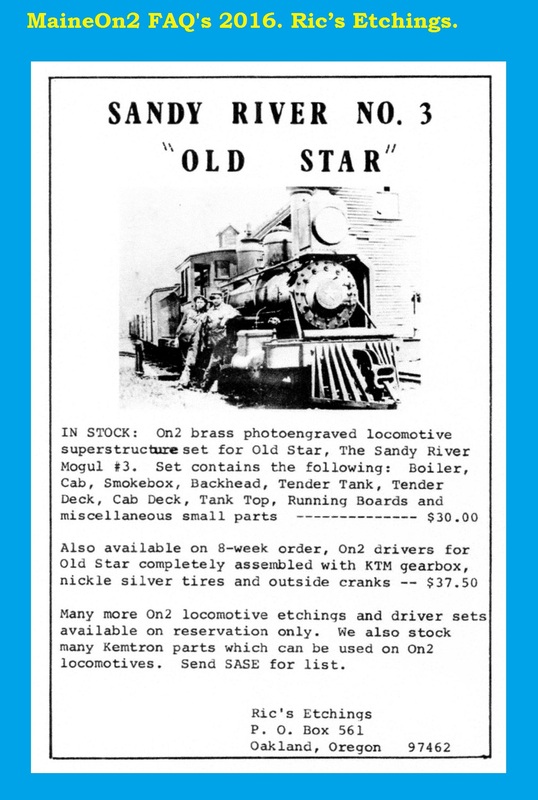 SRE ran this advert in the Narrow Gauge and Short Lines Gazette magazine from January/February 1981 until September/October 1982, after which they appear to have taken a break from advertising in the Gazette, and then resumed on a spasmodic basis with other products (ie not Maine On2). 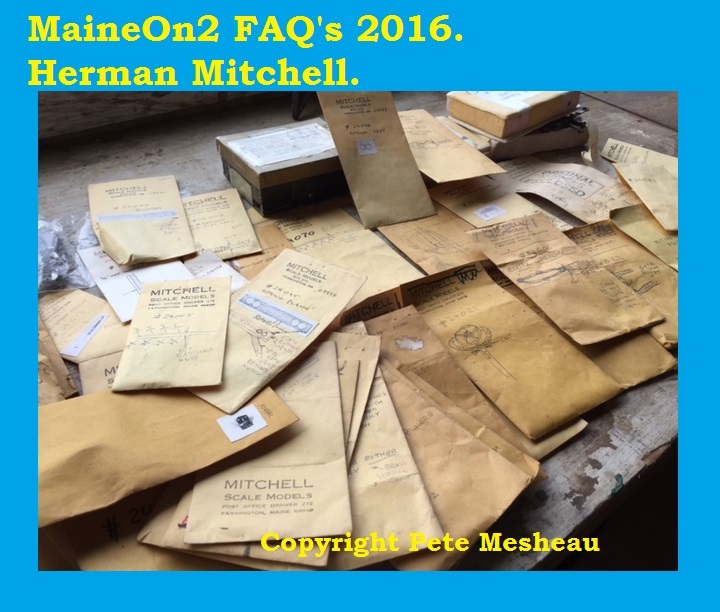 Note that our review period currently finishes at the end of 1986, and that the focus here is on the Maine On2 items. 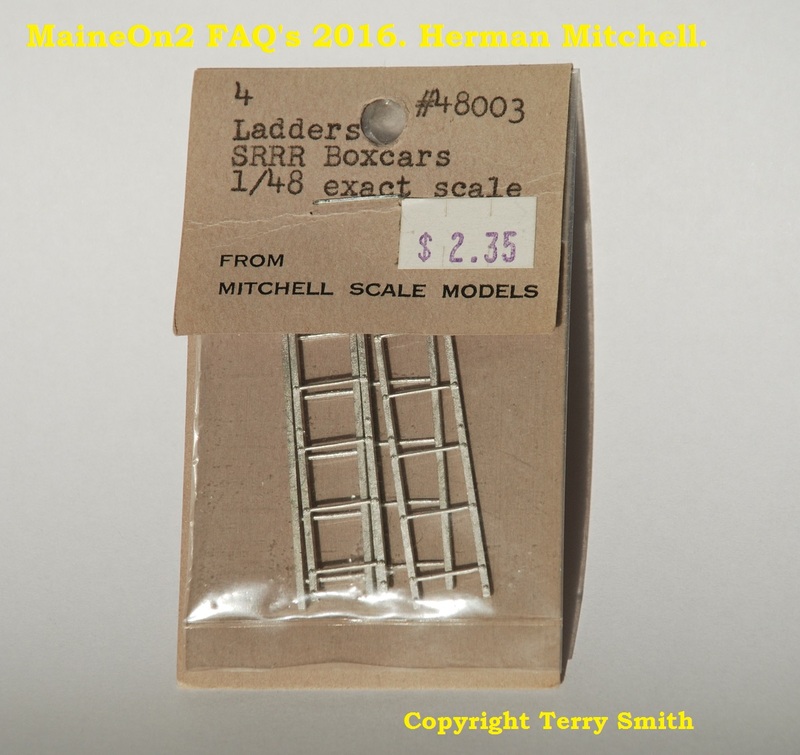 The SRE catalog: this catalog was obtained sometime in the early 1980’s, and carries a listing of UK sourced 7mm scale figures. 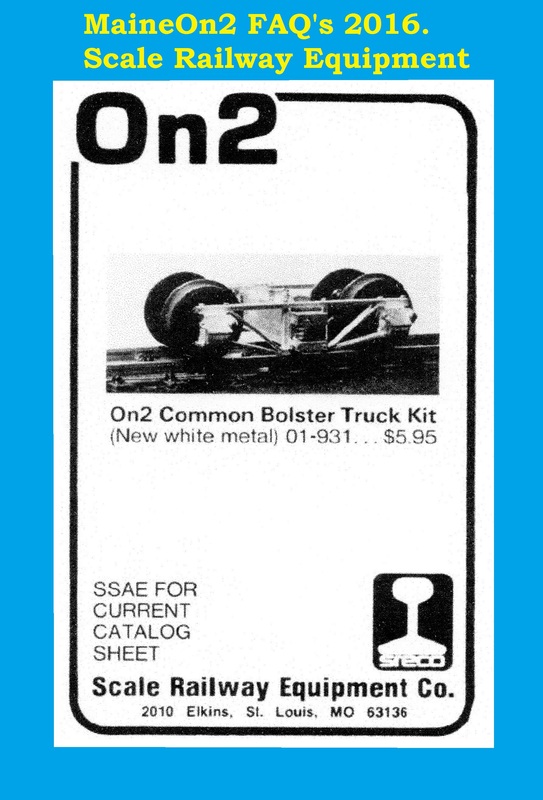 The first advertisement for this car kit appeared in the November 1971 edition of Finelines magazine. 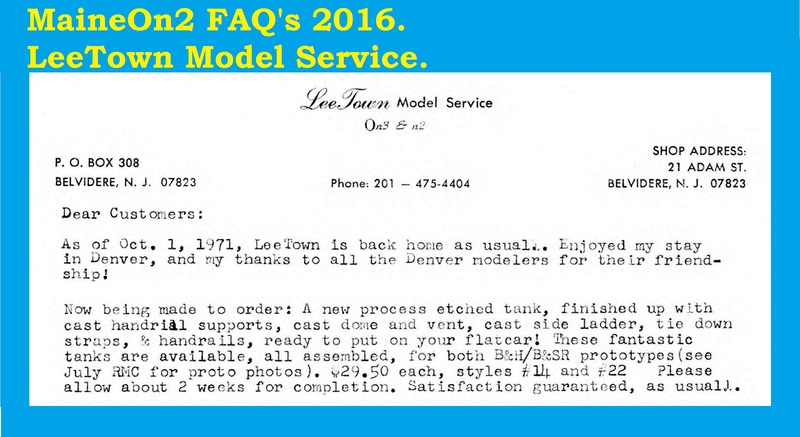 This model was first announced at the end of 1971 and was available from the end of 1972 onwards. 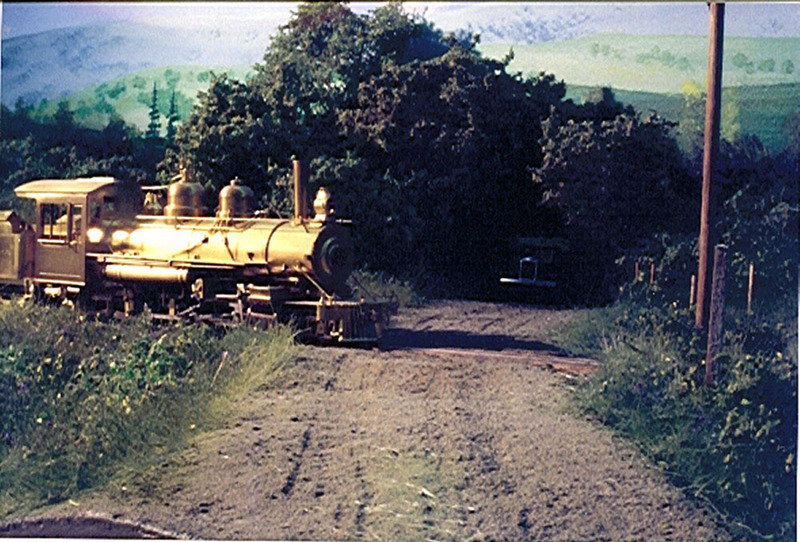 The tank was an epoxy resin casting produced by Bill Clouser using his “Custom Cast” process, and included the dome, with a separate casting for the cradle. 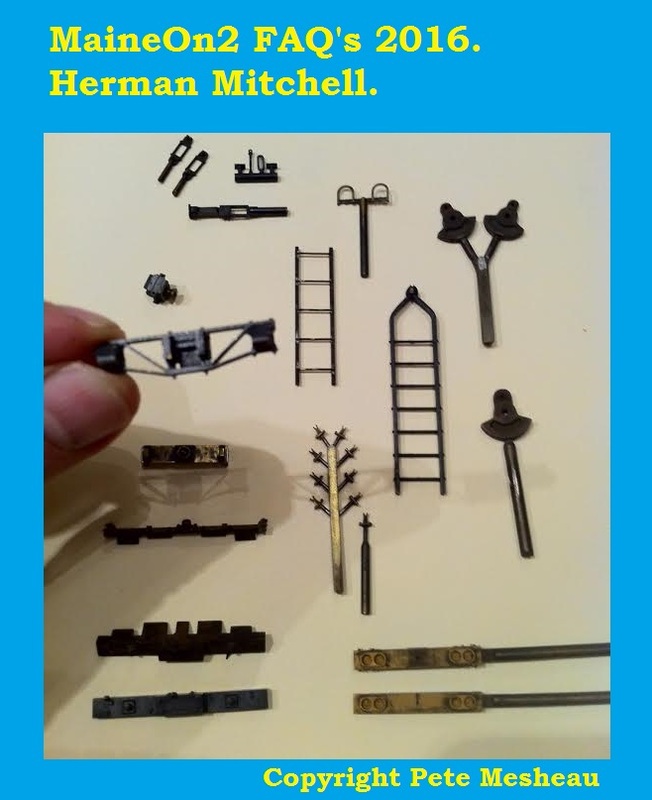 Details such as the filler cap, relief valve, handrail supports, ladder were investment cast brass. 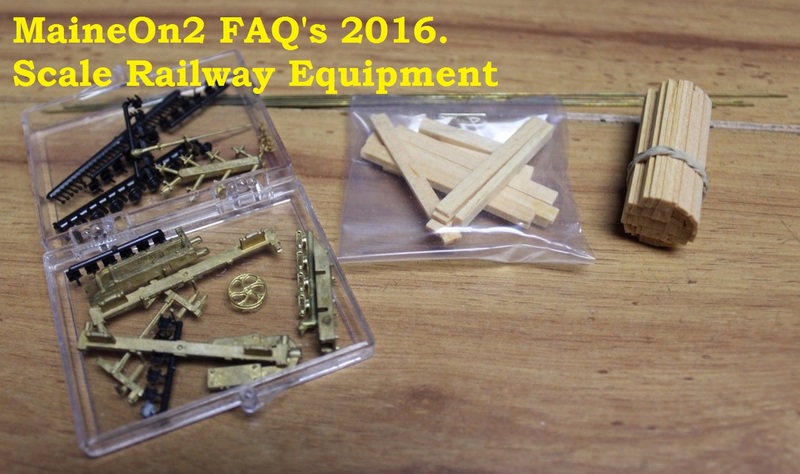 Handrails, bridle and grab irons were brass wire. 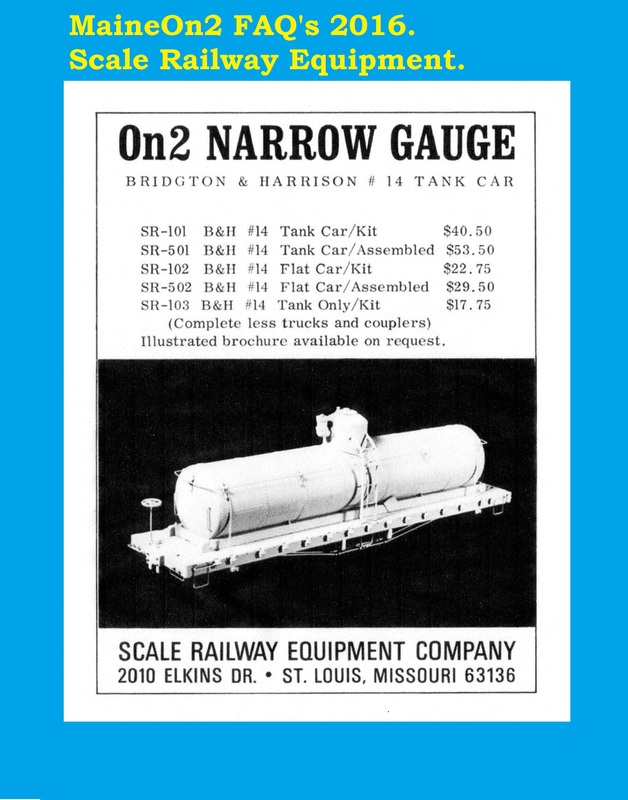 As shown in the advert above, the tank was available separately or with a cast 30 foot flat car body. 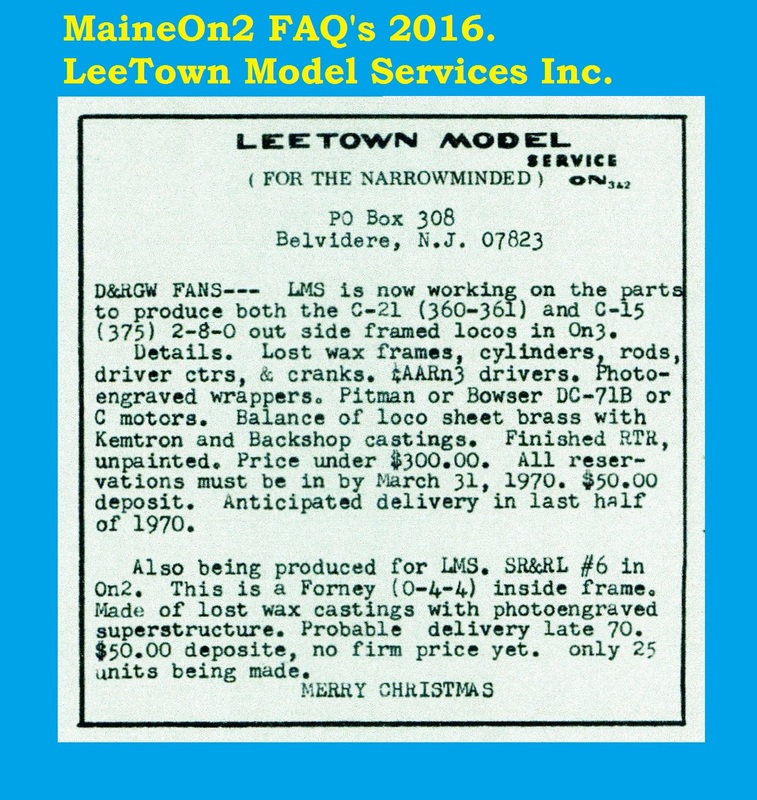 The model was introduced at the end of 1972 and was reviewed in Railroad Model Craftsman, June 1974 edition with corrected photographs in the July 1974 edition. 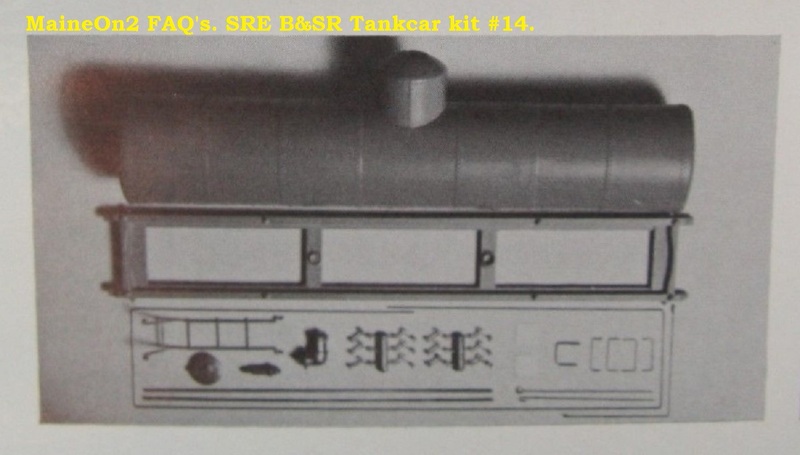 Parts of the tank only kit, taken from the instruction sheet illustration. 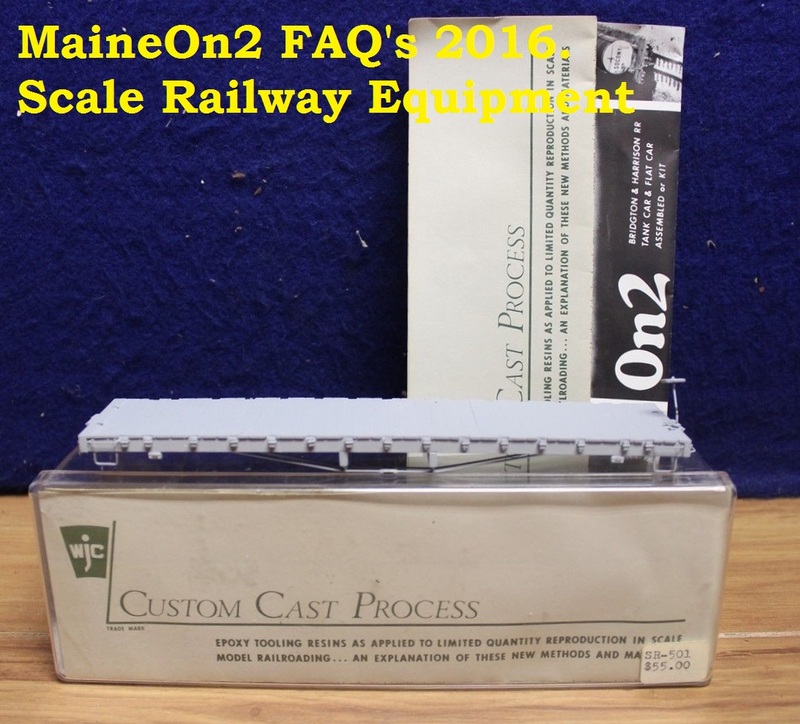 Notice the Bill Clouser Custom Cast logo and labelling. 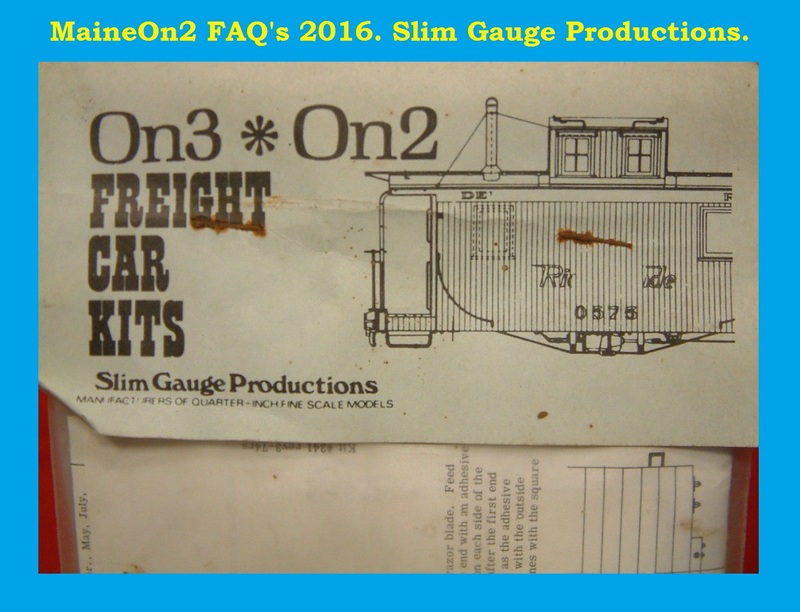 These two pictures show the 30 foot flat car model to carry the tank car body. 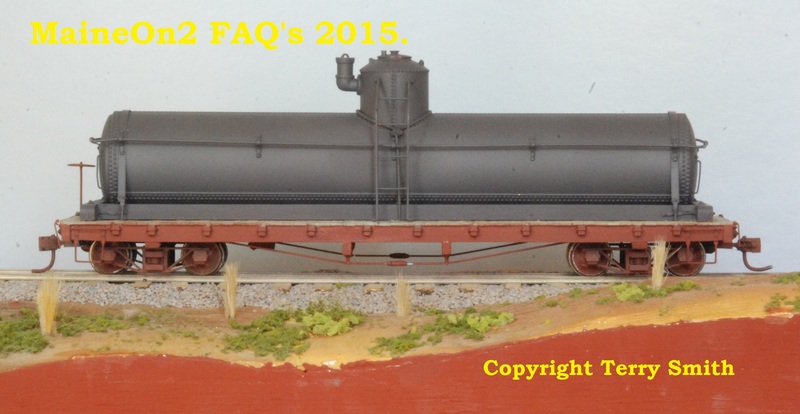 For further pictures of the SRE Bridgton Tank car model click here to open another page in your browser. 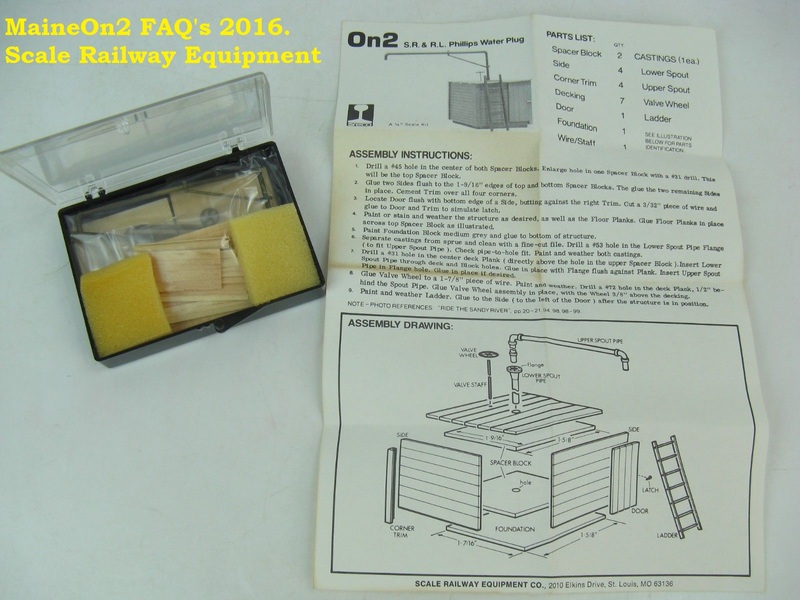 This kit appears to have been announced in the November/December 1977 edition of the Narrow Gauge and Short Lines Gazette magazine. 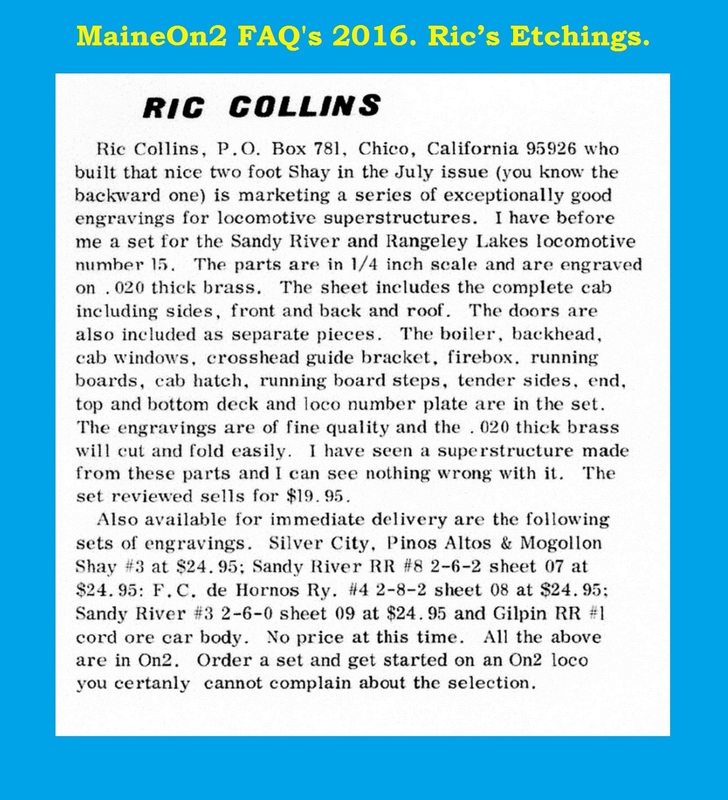 It was reviewed in the January/February 1981 edition with the comment “…back on the market…”. 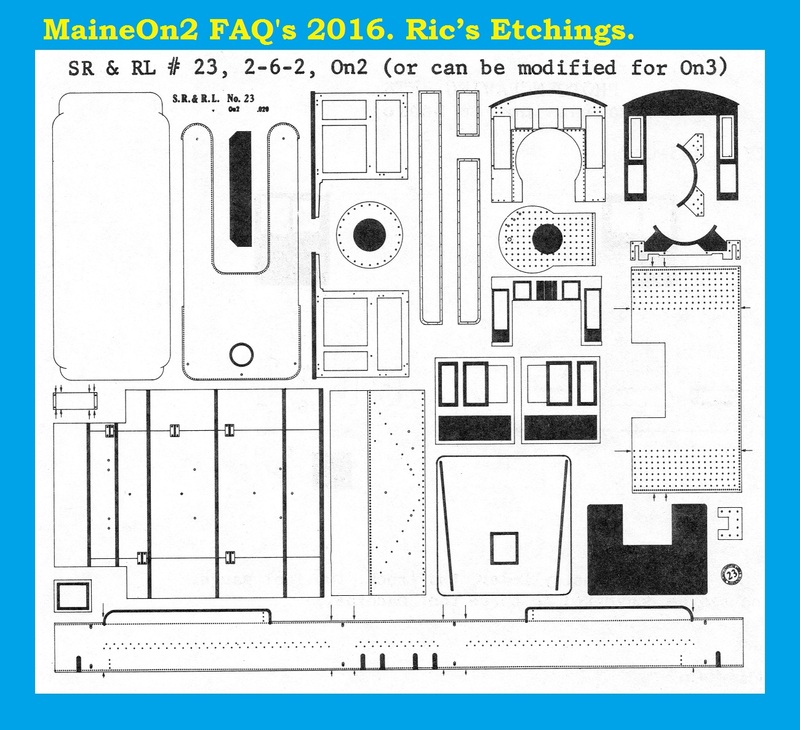 15-10-2016: this new topic is undergoing revisions and updating (already! 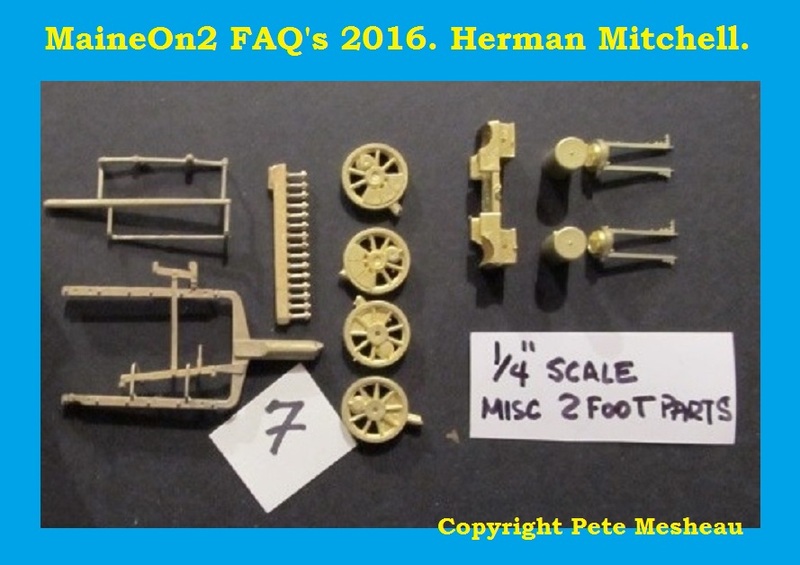 ), thanks to a couple of people who have sent in additional information and PICTURES!. 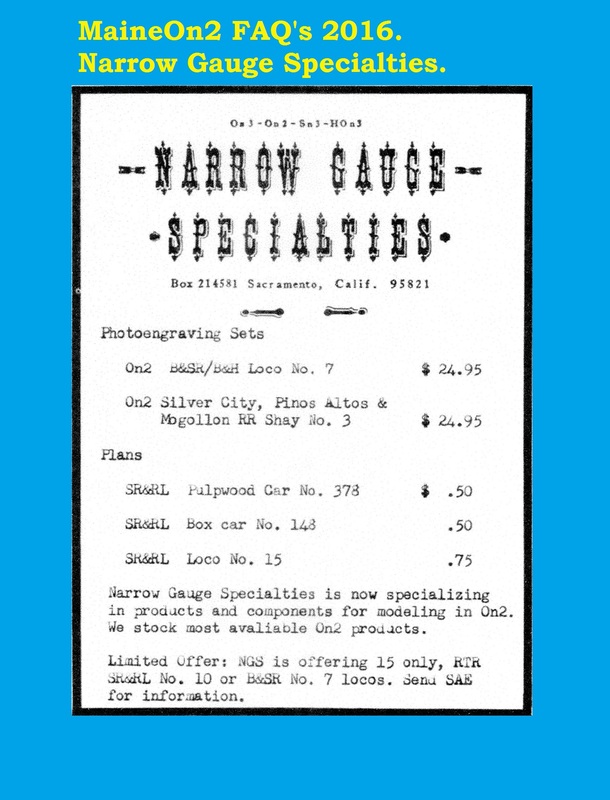 The quality of some pictures shown here may be “marginal”, but the editors believe that a marginal picture is better than none. 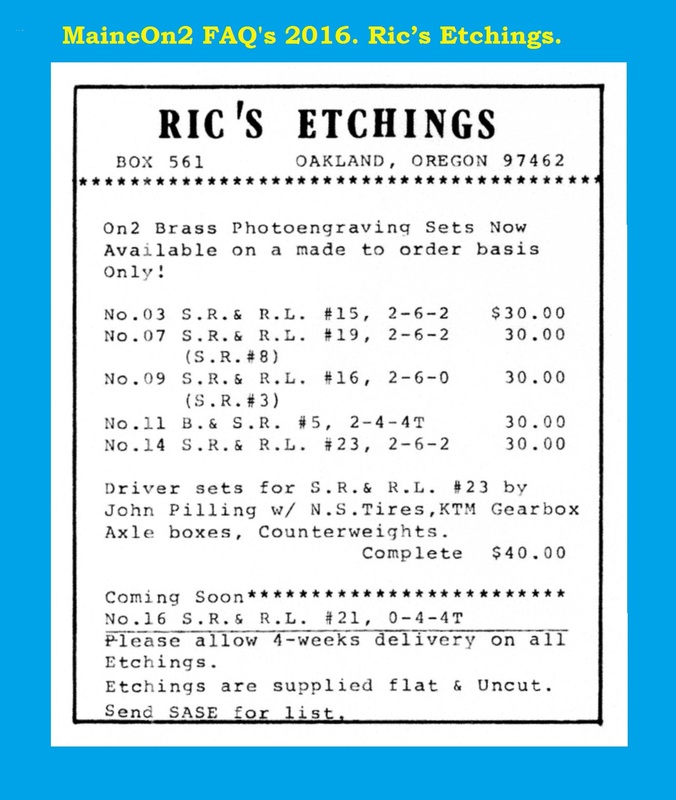 If you are in a position to send better and/or different pictures then please get in contact. 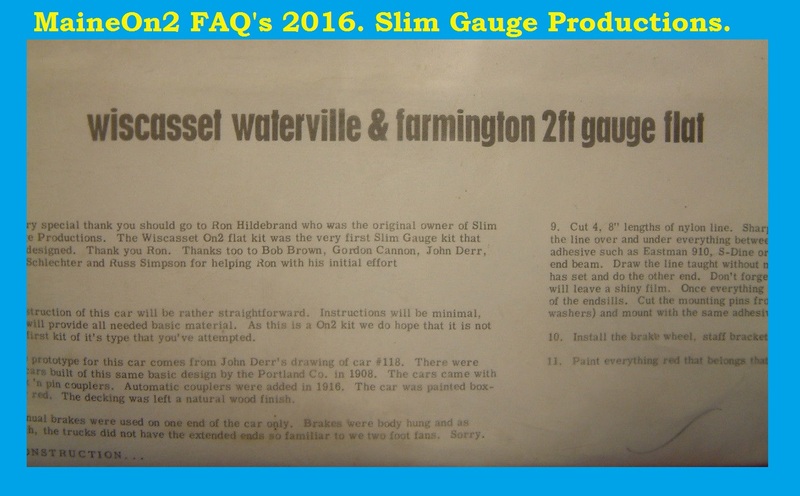 Update received 14-10-2016 from Frank Pearsall: Slim Gauge Productions was Ron Hildebrand. 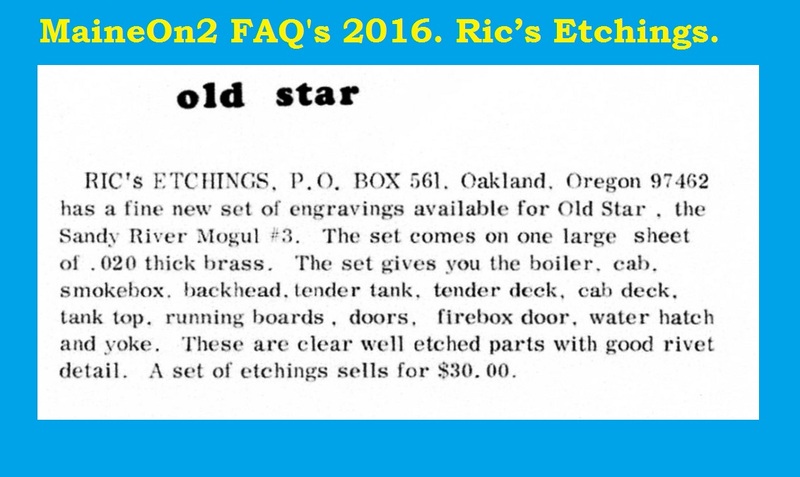 And yes, he was good friends with Russ Simpson so he had a lot of work done by Russ. 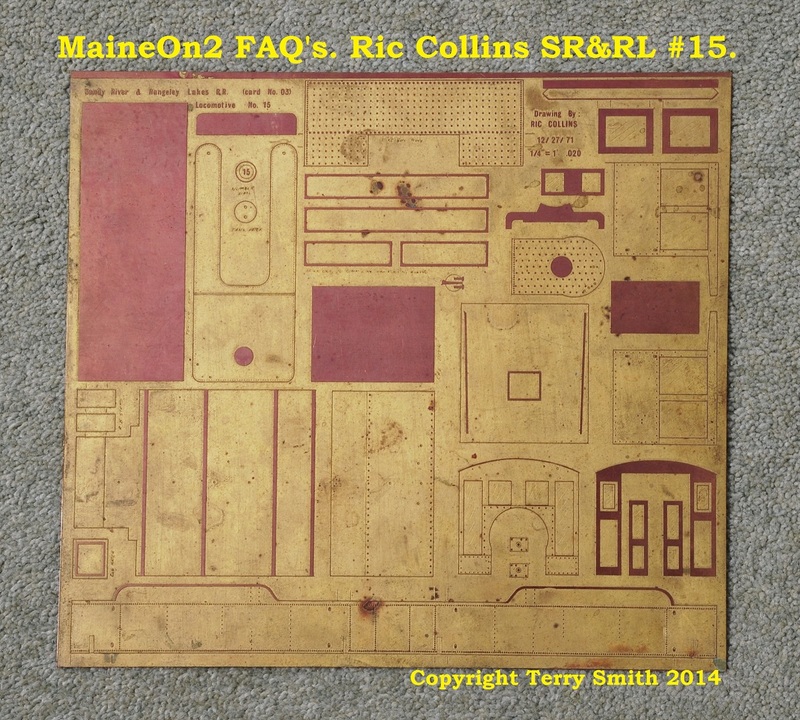 Ron later had “The Structure Company” in the 1980s. 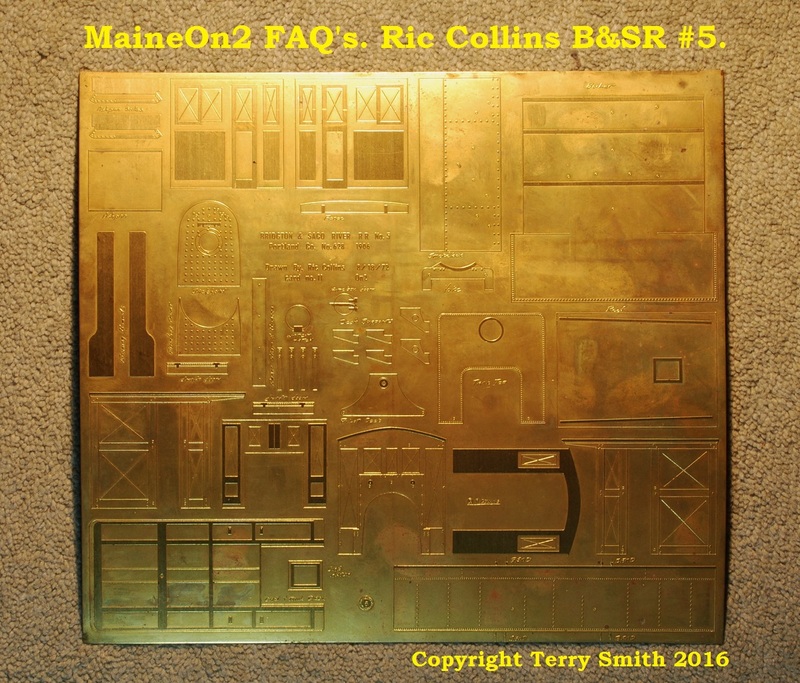 Produced some really neat buildings. 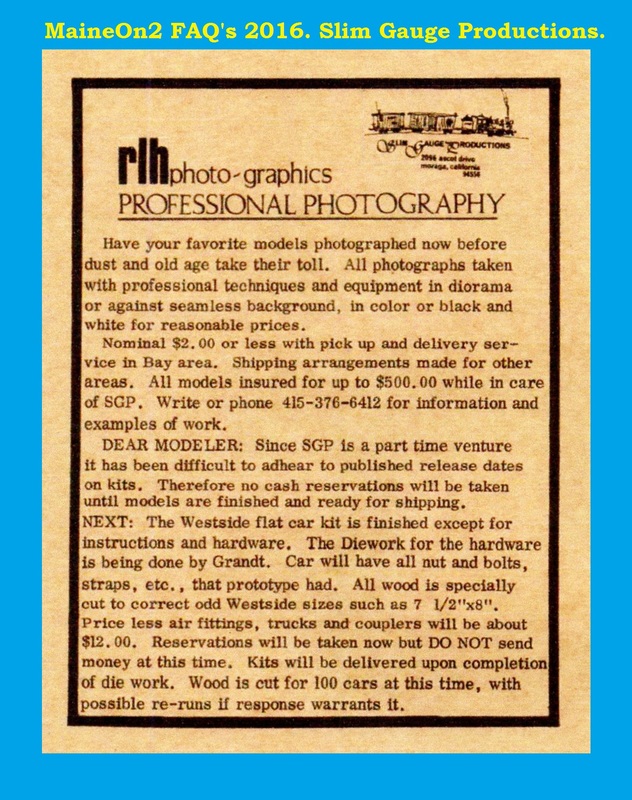 He was a first-rate photographer and also had that kind of business. 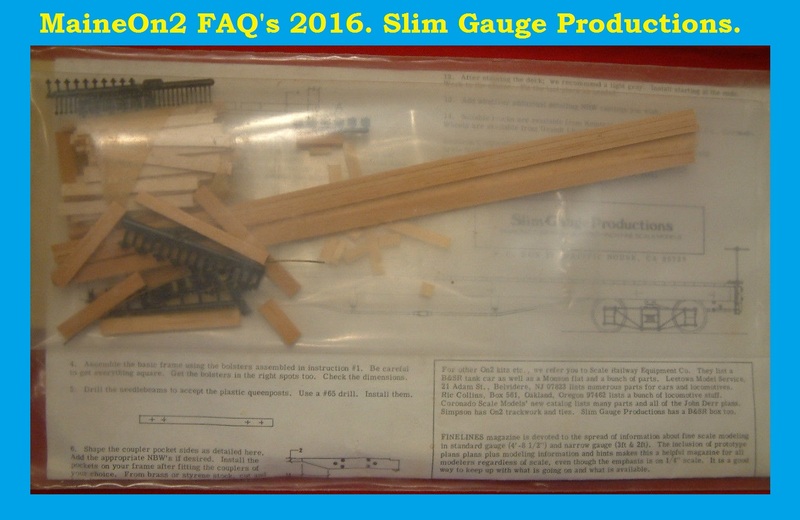 Slim Gauge Productions as a kit manufacturer is yet another enigmatic concern from the 1970’s whose previous existence is flagged up very occasionally when one of their kits appears on eBay. 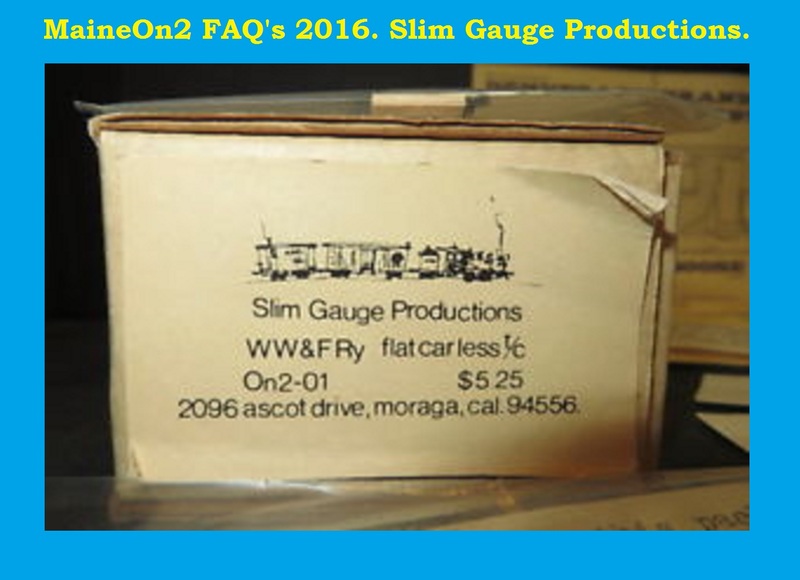 Slim Gauge Productions appears to have started trading in May 1970 with it’s first advert in Finelines of the same month (above) and its kits were available new until the end of 1978. 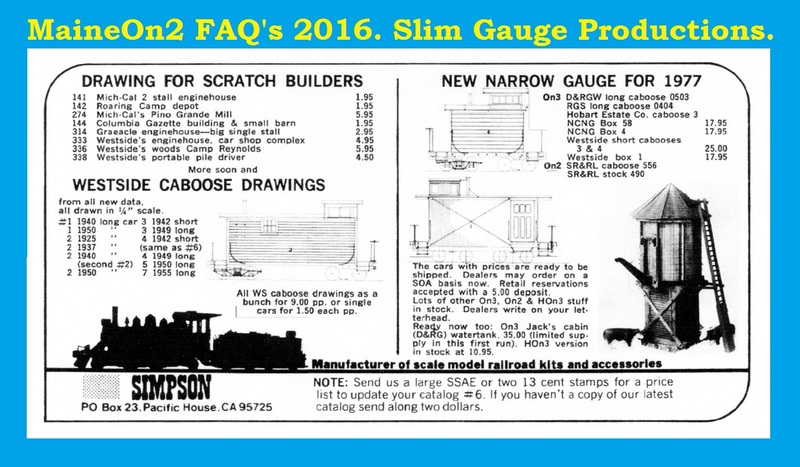 From a July 1971 advert, it appears that Slim Gauge Productions was started by a professional photographer using contractors (possibly Russ Simpson) to cut scale wood to exact prototypical dimensions and Grandt Line to supply injection moulded hardware. 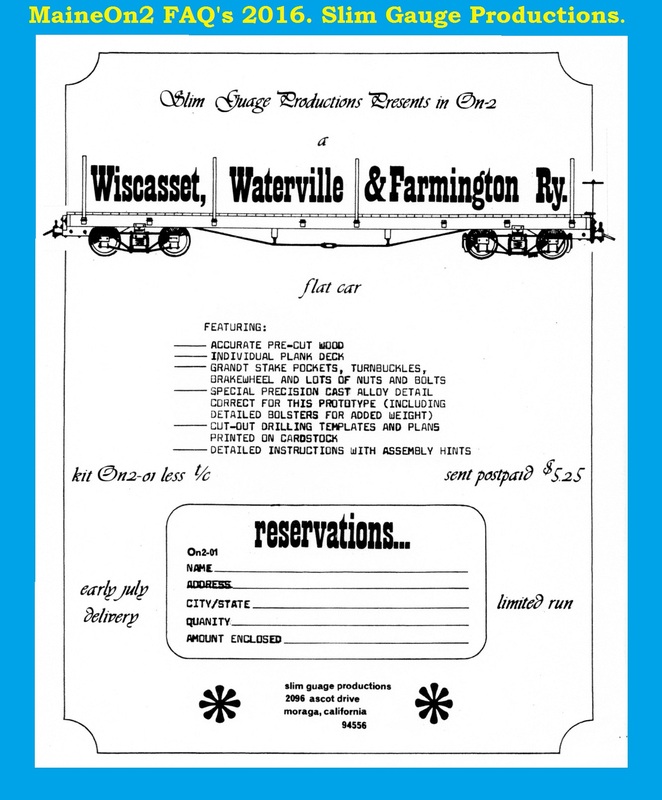 The initial offering was an On2 Wiscasset flatcar, and additional On2 items offered (eventually) included a 26 foot Bridgton boxcar #45-51 (January 1971), SR&RL Caboose #556 and SR&RL Stockcar #490 (both March 1977). 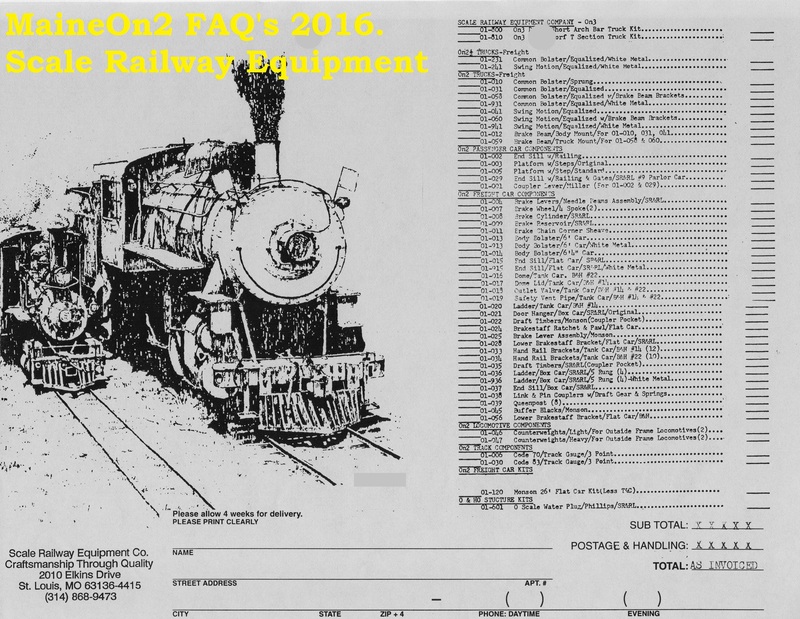 Various On3 items were also produced. 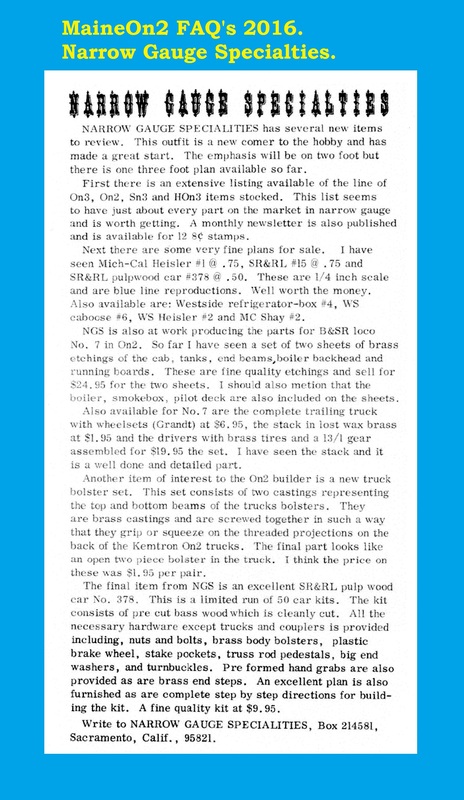 The history of Slim Gauge Productions appears intertwined with Russ Simpson, as from September 1975 he advertises the former SGP kits in his own adverts, and introduces the SR&RL Caboose #556 and SR&RL Stockcar #490 kits in March 1977. 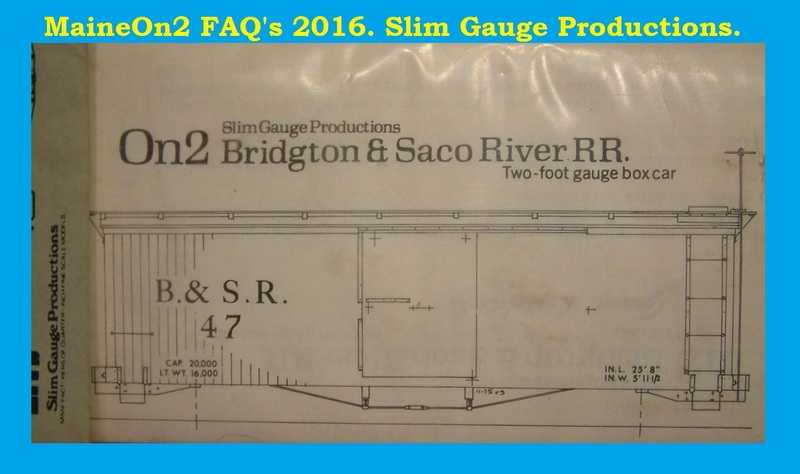 An announcement in the Narrow Gauge & Shortline Gazette states that “Simpson is to stop production of the entire Slim Gauge Productions kit line, due to the pressure of outside interests”. 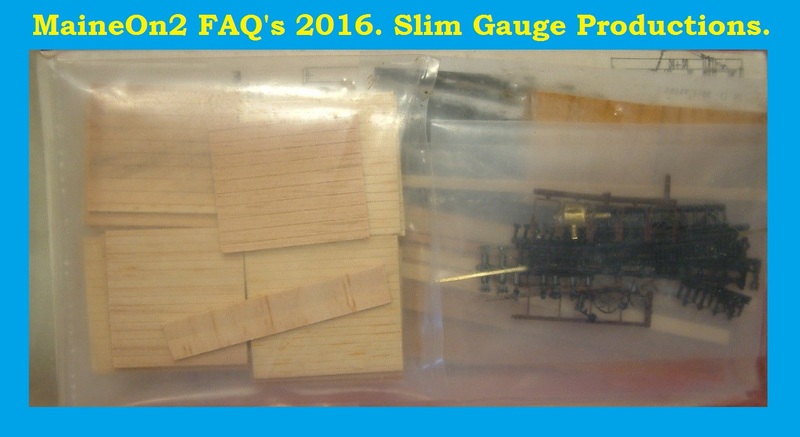 A poor photograph of the WW&FR flat car kit box – please let us know if you can provide better photographs of any SGP kits! 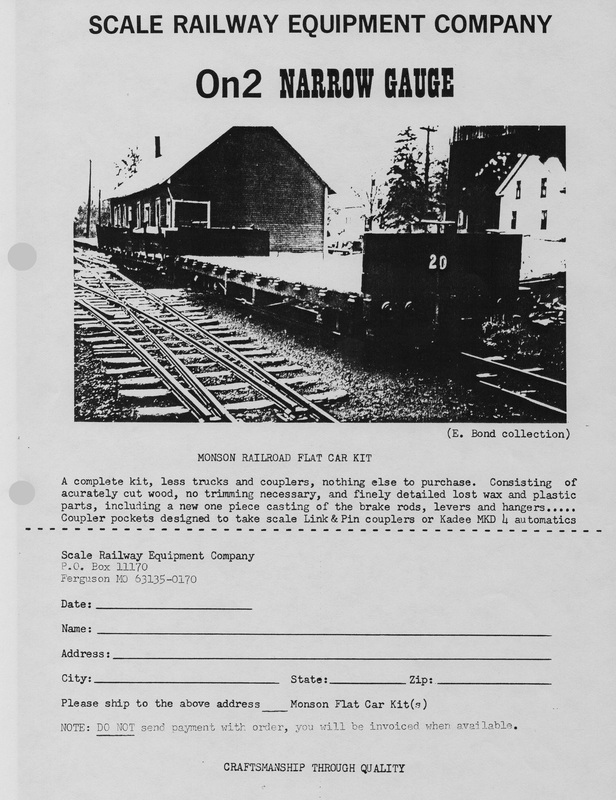 An individual kit of the Wiscasset #118 Flatcar. 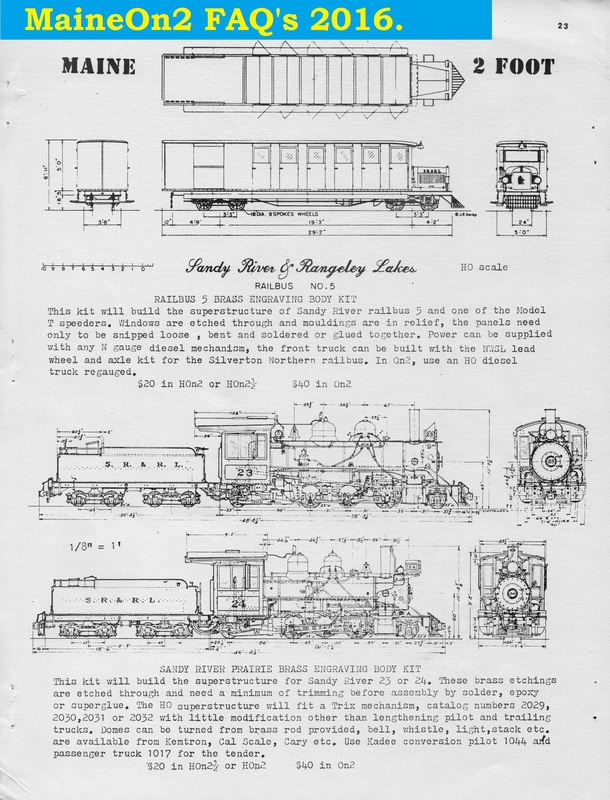 Part of the instruction sheet for the version of the kit produced by Russ Simpson, in which he acknowledges the original SGP owner, Ron Hildebrand, and the various other modellers who helped develop the kit, including Bob Brown, Gordon Cannon, John Derr, Bob Schlechter and Russ Simpson. 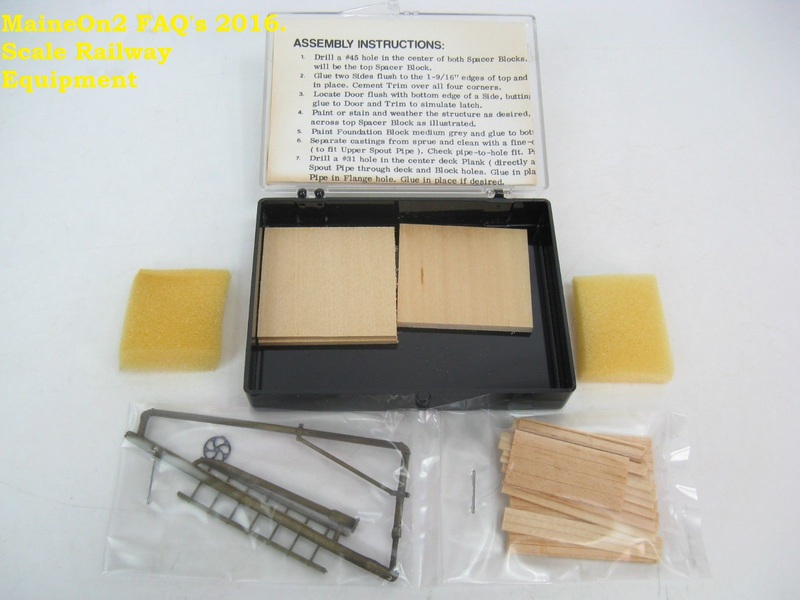 The kit was typical of many 70’s era craftsman style wooden kits, containing a collection of stripwood plus details from injection moulded plastic, lost wax brass and brass wire. 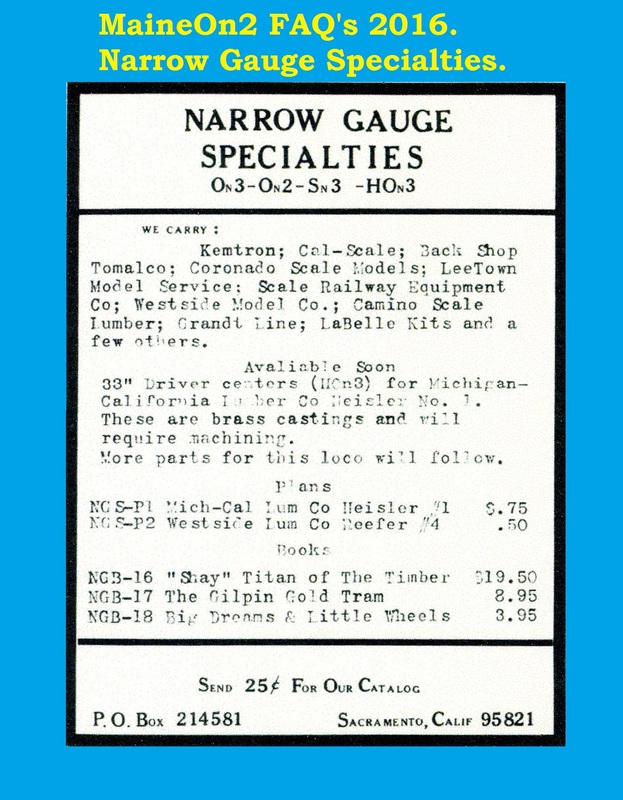 Also notable are the mentions of other suppliers in the boxed text on the instruction leaflet shown at the bottom right corner of the picture above. 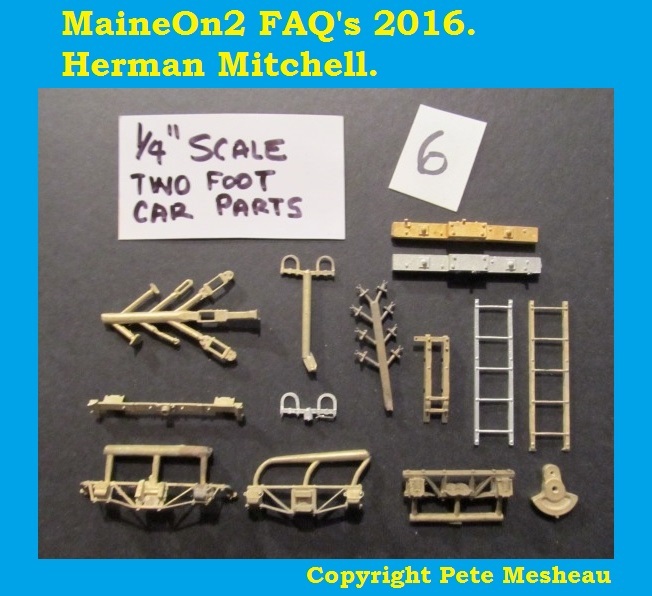 These include Scale Railway Equipment, Leetown Model Service, Ric Collins, Coronado Scale Models, Simpson (trackwork) and a big plug for Bob Brown’s Finelines magazine. 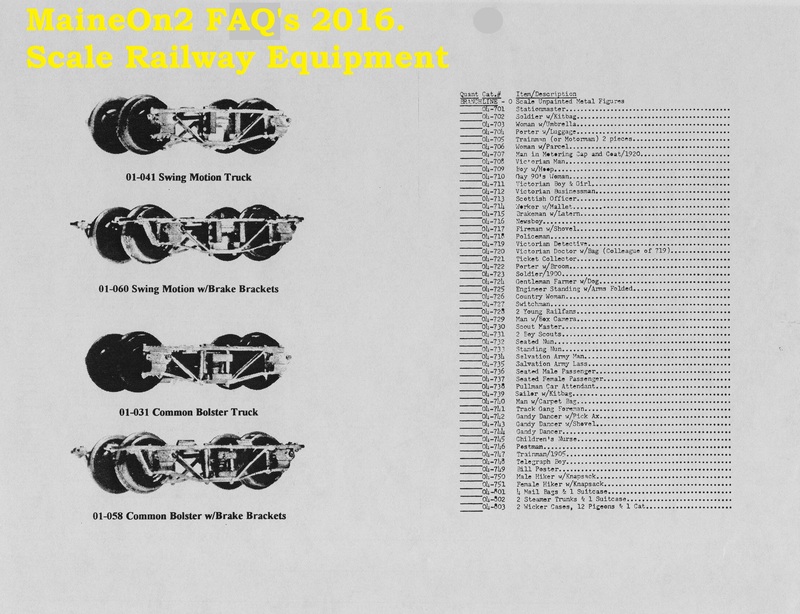 This advert from Finelines of July 1970 announces a last run of WW&FR flatcar and shows the new Grandt Line On2 wheelsets. 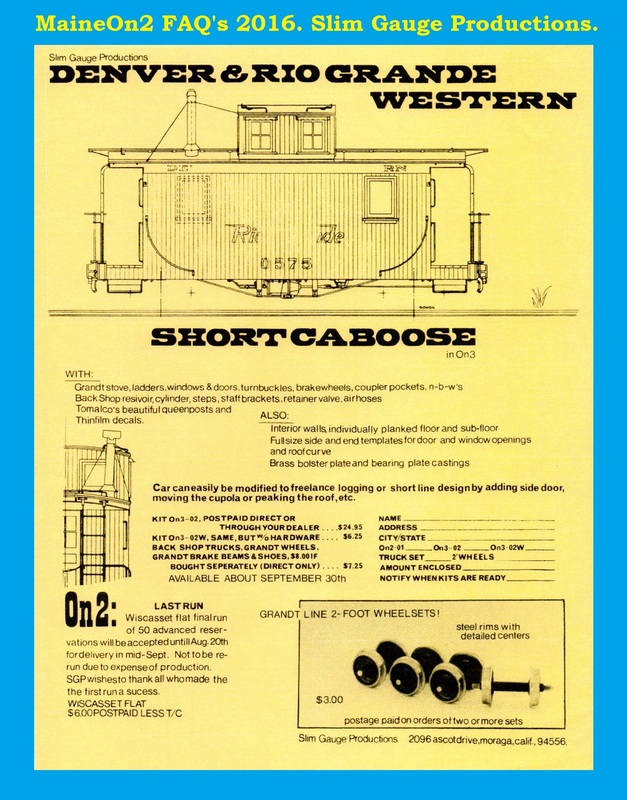 This advert from Finelines of November 1970 introduces the 26 foot Bridgton boxcar kit and indicates that the run will be limited to 100 pieces. 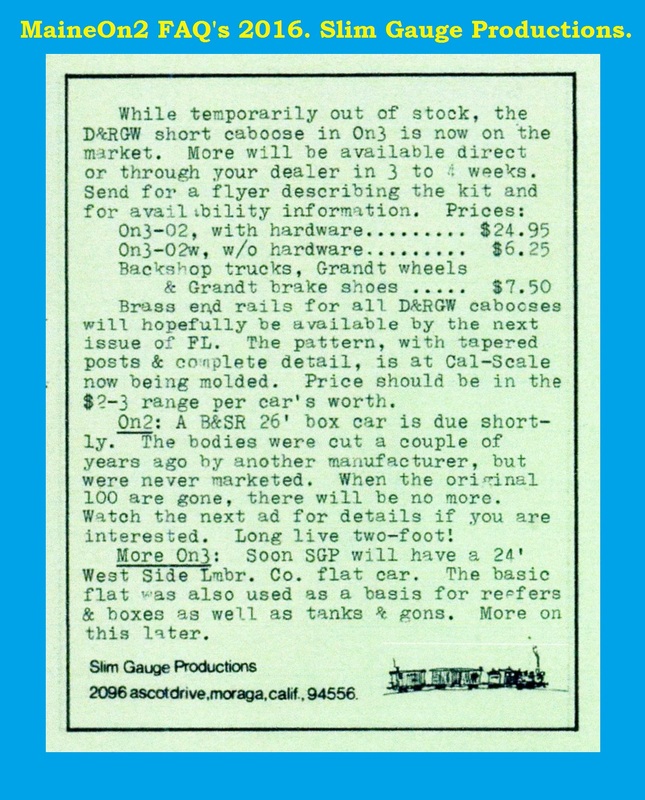 This very fancy advert from Finelines of January 1971 announces that the 26 foot Bridgton boxcar kit will be available shortly and that the run will now be limited to just 50 pieces. 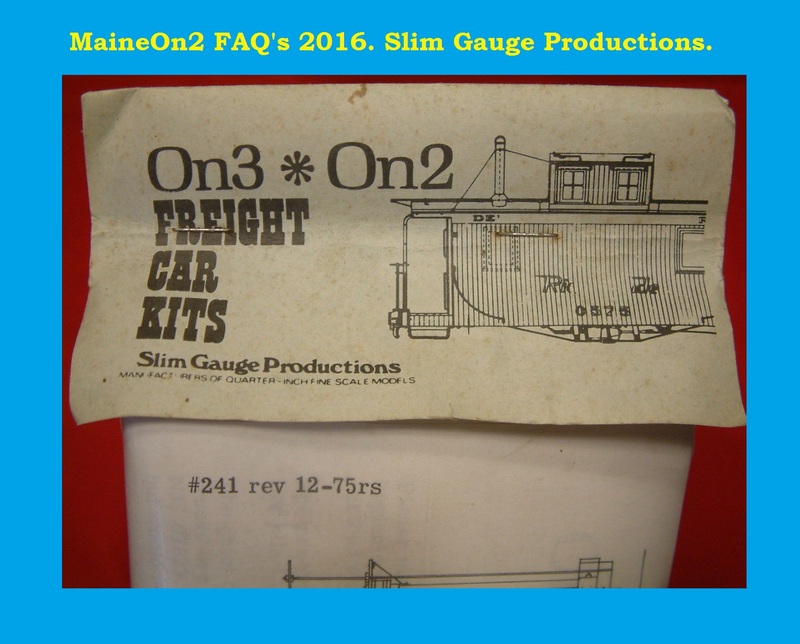 An individual kit of the Bridgton #47 Boxcar. 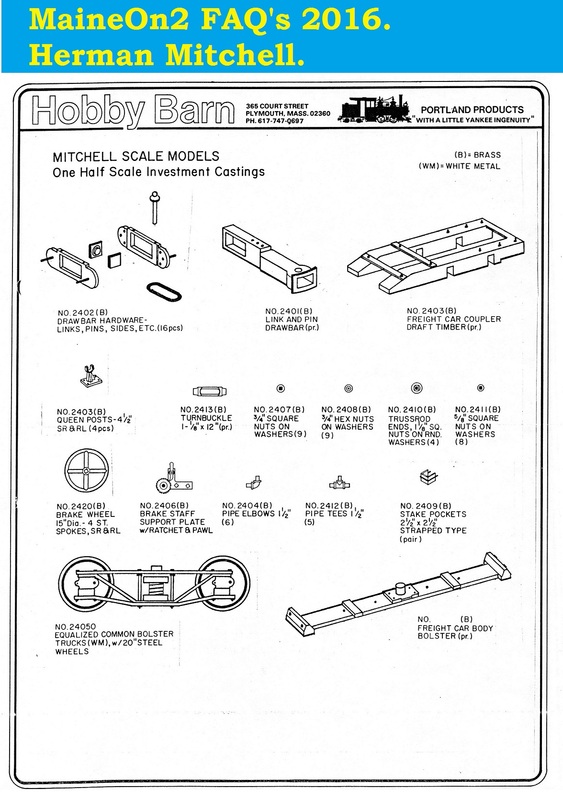 The plan showing through the kit bag. 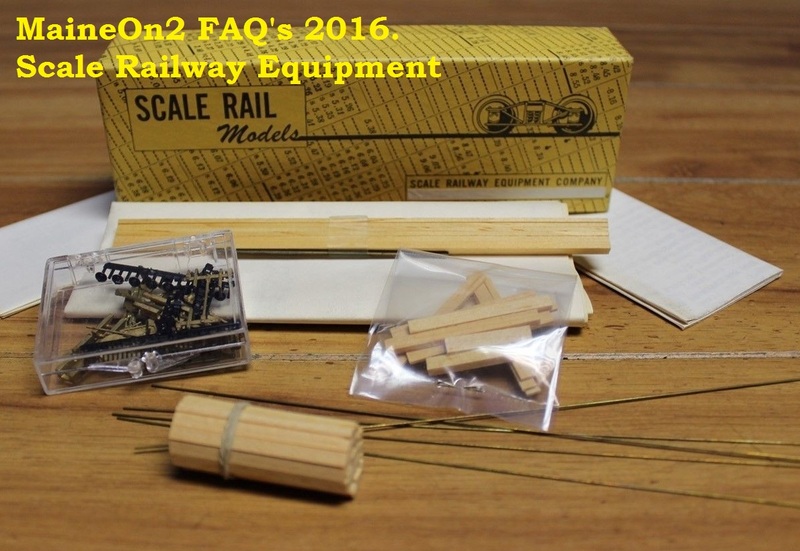 The boxcar kit followed the typical style of many 70’s era craftsman style wooden kits, containing a collection of stripwood, scribed sheetwood and basic blocks to build the body plus details from injection moulded plastic, lost wax brass and brass wire. 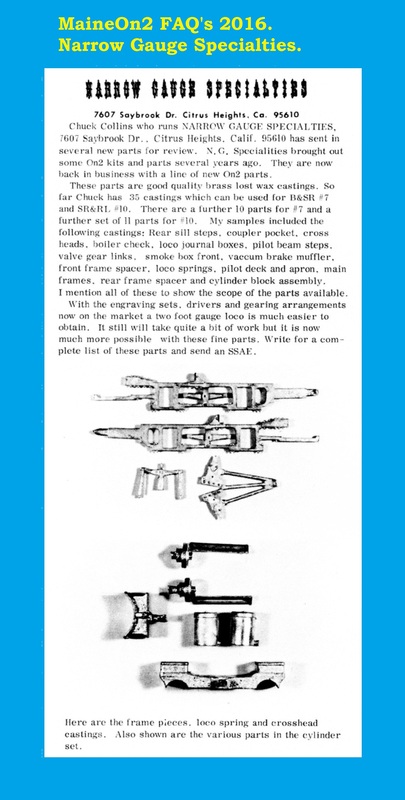 This advert from Finelines of July 1971 gives some information about SGP and how it operated. 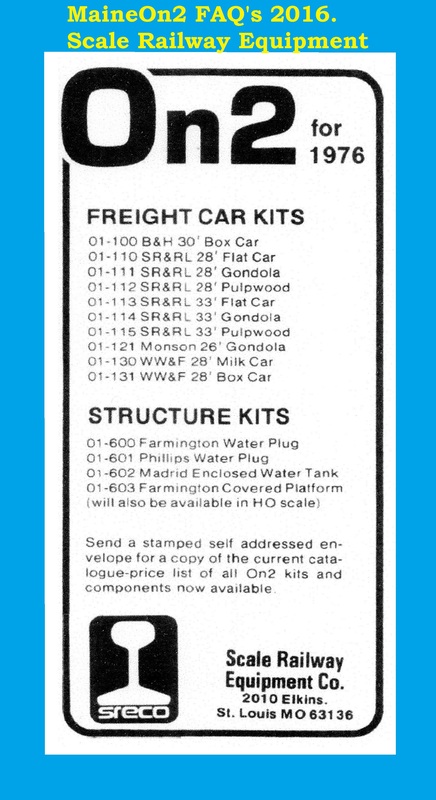 This advert from the Narrow Gauge & Shortline Gazette of September 1975 by Simpson lists the former SGP kits. 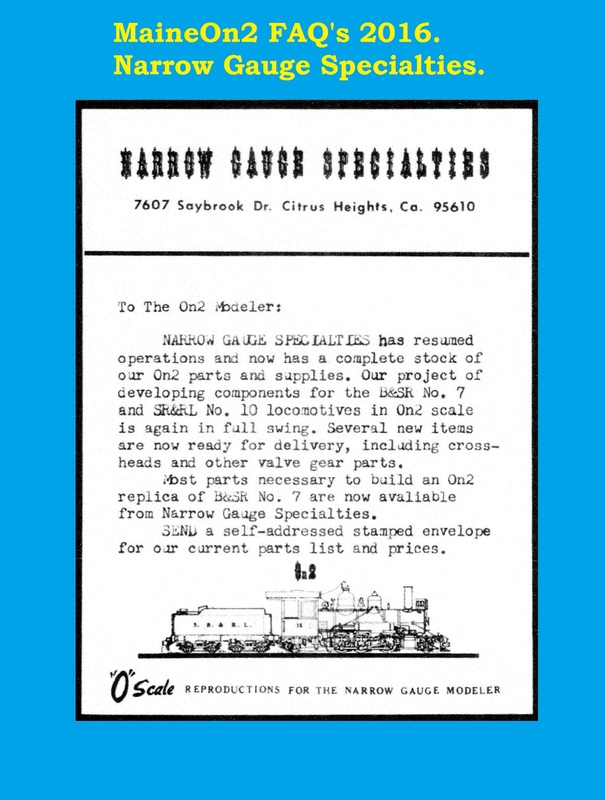 This advert from the Narrow Gauge & Shortline Gazette of March 1977 by Simpson introduces the SR&RL Caboose #556 and SR&RL Stockcar #490 kits.